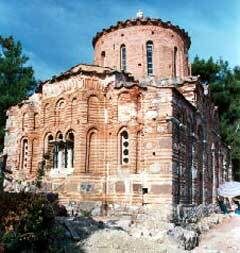 The exact date that the church Panaghia Krina was built remains unknown. The date 1287 was inscribed in the southern portion of the church and is believed to be its construction date. Nevertheless, it is believed that the church was erected at the end of the 12th century to the beginning of the 13th. The church has been well maintained; its architecture is that of the “island” octagonal type and resembles the main church (katholicon) of Nea Moni to a small degree. It is comprised of the dome, the esonarthex and the exonarthex. The catastrophic earthquake of 1881 destroyed the hemispherical portion of the dome in addition to the smaller dome of the narthex, which was reconstructed shortly thereafter. The majority of the interior walls are covered with paintings, the first of which is dated to the 13th century. Six different periods are exhibited on at least two layers which characterize how Chian art progressed over time. The first illustration (dated around the 13th century) is directly across the entrance of the church, on the narthex and stretches into the main portion of the church where the more recent layer dating from the Turkish Occupation is apparent. This illustration depicts scenes and portrayals of the saints and extends into the main portion of the church. Also located on the narthex, is another example from the Byzantine period, yet is of a completely different style. This illustration depicts various portrayals that are not clearly visible. The wall paintings that were detached from the second layer depict 12 prophets, dated to the end of the 14th century in addition to two marble blocks derived from the original iconostasis of the church are all displayed in the Ioustiniani Palace in the Castle (Fortress) of Chios. Portions of the murals painted by Michael Chomatzas in 1734 are also on display in the Byzantine Museum of Chios (the Medjitie Mosque).